Protects hair and scalp, without making the hair sticky. Suitable for use with hair curlers or to scrunch dry curls into hair. Suitable for use on towel-dry hair or also in dry hair. Gives the hair more volume whether for short or semi-long hair, also for use on fine hair. 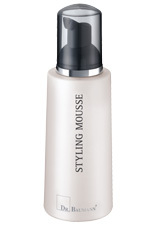 Apply the styling mousse directly onto the hair roots and then dry the hair in the opposite direction to what it falls. Long hair and the ends of the hair should be shaped using a round brush.